NHS/EmergencyServices/Military 10% Discount still active at Iceland, but ends soon! 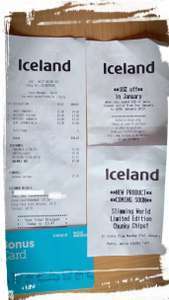 The pre-Xmas NHS, Emergency Services & Military 10% discount is still active at Iceland, but ends soon! This isn't a glitch, it's a previously advised promotion, so don't go mental. The deal does end soon however, and I have the 16th of January in mind, but I'm sure somebody else shall know better (I shall check my emails when back at work later however). Further: They also offer Weight Watcher 10% discounts, which if not active currently, shall probably be on again immediately since Iceland are adding to their already sizeable Weight Watchers range. Even Further: There are many online deals, all of the above being in store only deals, where 10%, 20% & Save £5 when you spend £30 type things for the NHS and Military discount schemes. Login and have a look (although I find their websites to be rather clumsy). The store staff think it was only pre-Xmas, but as with the initial NHS discount last summer, when it started, it gave almost a month, and was followed by almost a further full month straight away. Perhaps, as the pre-Xmas offer ended a bit before Xmas, the store staff became confused, but it defo restarted on 2nd January. Same, I was told that also. Think they are just trying to fob ppl off. OK to make use of the offer you will have needed to have added it before December the 16th. extended 10% discount throughout January 2019." I asked yesterday also and told finished. That was in Manchester. Our community here is a small slice of the UK, but if others come forward, maybe we could flag this chat to @iceland for a reply? [Image] OK to make use of the offer you will have needed to have added it …[Image] OK to make use of the offer you will have needed to have added it before December the 16th. "Pick up a Bonus Card in store and register it before the 16th December 2018 to get yourextended 10% discount throughout January 2019." Return to Iceland, and lodge formal complaints Demand the refund you are due, and restitution for being lied to. An admin has seen fit to relist my final price as FREE, making this offer -100% ... Personally, I consider this to be VERY misleading, but who am I to try and take admins to task? I've tried loads, and seldom had any joy there. So, if you came here looking for 100% savings, I feel for you. But this is only 10%, and even then only for limited eligible folk. extended 10% discount throughout January 2019. This probably won’t go down well but WHY do you get a discount for doing your job?? Discount still worked for me today. Scanned my blue bonus card. Valid until 29th Jan. This probably won’t go down well but WHY do you get a discount for doing y …This probably won’t go down well but WHY do you get a discount for doing your job?? Or in a cynical manner, the NHS is one of the biggest employers in the world. Add all the others, police, fire, mountain rescue, RNLI etc then you get a big chunk of society. That big chunk of society gives you a bigger market share, your stats look better with more customers. Maybe they are just that shallow? But who cares? The discount covers pretty much EVERYTHING I the store ... Even ALCOHOL What's not great about that? It's actually bloody mental that this ends a day before the last Thursday of the month ... Our standard pay day. Why end it just before payday, especially the January payday?